Energy remedies, magic energy potions, energy anti-venom, positive energy - here are the 7 Energy Remedies for energy body problems. Use the 7 Energy Remedies game for healing and evolution by yourself, as often as you like, or play with friends, family and paying clients. Art + Energy = MAGIC. There are seven magicial energy remedies to choose from. Which one do you want to take, right now? EMO the energy remedy to an energized end state. Focus on one of the energy remedies. Where do you feel this in your body? Put your hands there. Where does this energy need to go? Use your hands to trace the path. Blockages or reversals along the path? Use your hands of energy and give the "Soften and Flow!" instruction with your mind. Found the pathway all the way in, through and out? Excellent! Now re-focus on the energy remedy of your choice and speed up the energy flow until you reach The Energized End State. Focus on the energy remedy of your choice. Keep the focus on the Heart Position, and on every energy point. Use the energy tapping to remove blockages so the energy can flow in, through and out freely and fast, all the way to a +10. Take the energy remedy to the perfect place in time and space in Sanctuary. 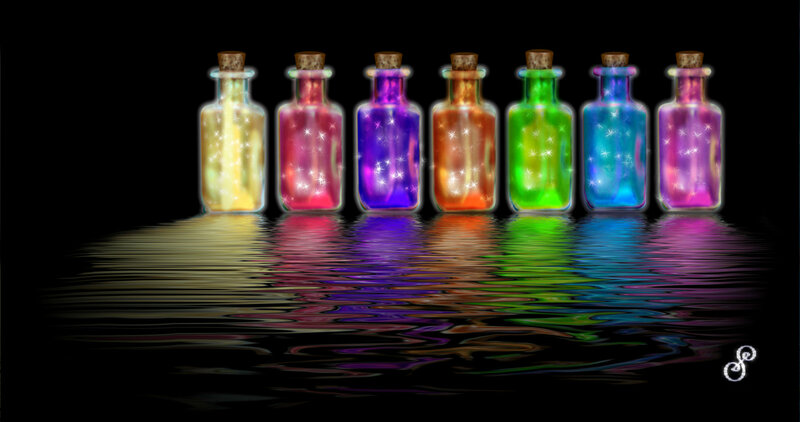 The seven magic energy bottles all together are a course of healing and uplifting for your energy body. Which one will you choose first? Think about a problem you have had for a long time. Which energy tonic/s in which order are the solution? Which one is first? 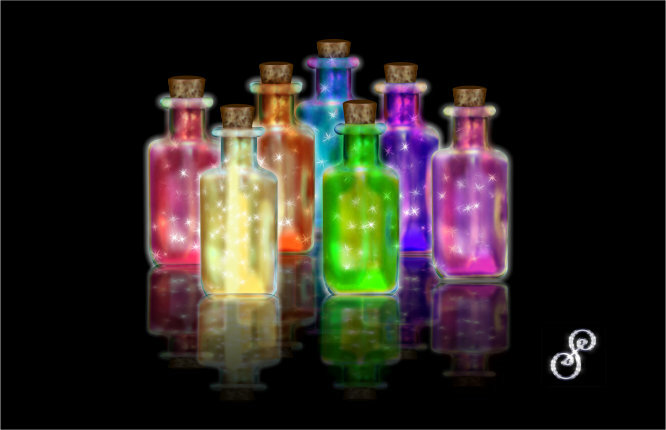 Which magic energy potion do you NOT want to take? Very interesting! Resolve with EMO or Modern Energy Tapping as above. Expand your focus and EMO all the remedies together at the same time.